Attitudes toward what used to be called “the demographic time bomb” are improving: Europe’s ageing workforce is increasingly seen as a factor of growth and innovation. Yet while employers are fully aware that the workforce is ageing, they do little to prepare for this change, and certainly not enough to make the best of it. 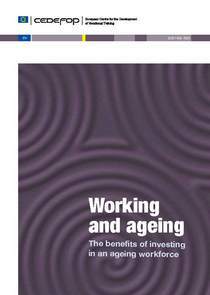 Cedefop’s latest publication on working and ageing, The benefits of investing in an ageing workforce, collects papers that examine this ‘ageing paradox” and show how investing in learning later in life can bring real benefits to companies as well as individuals. The papers cover, among other EU Member States, Germany, Italy, England, Austria and Belgium, but also look at developments in Canada and the USA; sectors discussed range from the pharmaceutical industry to retail. The papers collected in this publication emphasise that employers need first and foremost to develop ‘demographic literacy’, i.e. to understand how to create a learner-friendly environment for employees of all ages. Successful companies, research shows, take a life-cycle approach to active ageing, addressing the learning needs of employees from recruitment to retirement.